Armada’s roof rails feature available crossbars, so you can haul everything from skis to bikes to kayaks wherever your next adventure takes you. Take your Armada to the next level with beautifully crafted, available 20-inch wheels. Their unique finish adds to the vehicle’s already extraordinary presence. Offering a unique design, the highly visible LED taillights let those behind you know what kind of vehicle they are following. 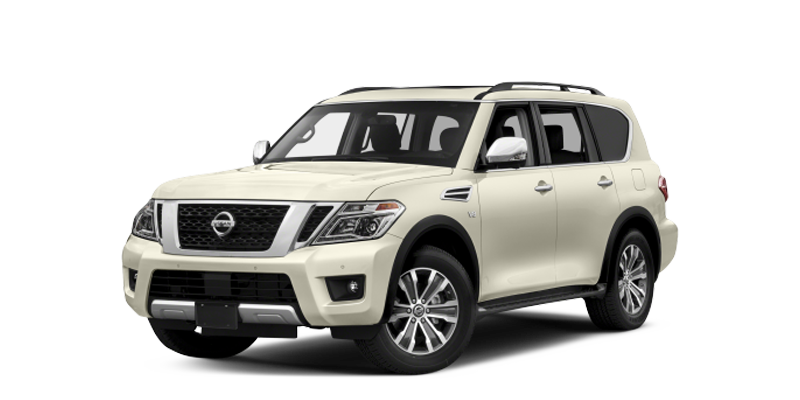 Stylish and functional, the chrome air vents on either side of the vehicle give Armada an even more distinct look. The available power rear liftgate automatically opens with just a pull of the handle or touch of a button on the Nissan Intelligent Key®. Available leather-appointed seats add a luxurious feel to the interior of Armada. Featuring beautifully crafted stitching and piping, they are accompanied by a double-stitched leather-appointed door panel and leather-appointed center console. Everywhere you turn, you see signs of a high-quality, crafted interior – from the use of wood-tone trim and metallic accents that provide a premium touch, to the gorgeous precision controls. The available Memory System allows you and another driver to save your preferred positions, so the Nissan Intelligent Key® recognizes who’s who, then moves the driver’s seat, steering wheel, and outside mirrors accordingly. Inside Armada, find your own ideal climate zone. Dual-Zone Automatic Temperature Control lets the driver and front passenger set their own temperature, while the rear-seat passengers get separate controls. Special vents in the upper dash and the rear help the system work efficiently by reducing heat coming through the windows. And for truly personalized comfort, enjoy available features like a heated steering wheel and front-row seats that heat up or cool down, along with heated seats in the second row. A quiet cabin is achieved through the use of acoustic glass on the windshield and the front side windows, as well as through expanded use of sound absorption materials. For a seamless entry, the available Nissan Intelligent Key® lets you tap a button on the door handle to unlock it, while your keys stay in your pocket. And if you use the Remote Engine Start System, and left your heat on, your Armada will already be warmed up and ready to hit the road. No more fumbling for keys, thanks to the available Nissan Intelligent Key® with Push Button Ignition. Just step inside your Armada, push a button, and away you go. The under-floor storage provides a perfect spot to store extra gear, while keeping it out of sight. And with its removable lid, access is never a problem. The available power third row gives you options at the touch of a button. When folded, you’ve got plenty of storage, and you can still seat up to five lucky travelers. Full house in back? See right past their friendly faces. At the flip of a switch, this available feature turns your rear view mirror into a camera screen, giving you a vivid, wide angle view, day or night. This available system watches the flow of traffic to keep the tedium out of stop-and-go. It helps maintain an adjustable speed and set distance between you and the car ahead, warning you if you need to slow down. It can also apply braking if you fail to respond, to help you avoid a collision, and can subtly apply the brakes as needed in slowing traffic. A radar sensor is on the lookout when you can’t see what’s going on ahead. It watches two cars ahead, monitoring your speed and distance, and when it detects sudden deceleration, it gives you a heads up to slow down. Available Automatic Emergency Braking watches one vehicle ahead and can apply braking to help avoid a collision or lessen the severity of an impact. Lane Departure Warning helps makes sure you change lanes only when you mean to. If it detects that you’re unintentionally drifting over, it will give you a heads up. Intelligent Lane Intervention goes a step further, tapping the brakes to help gently guide you back into your lane. Now you can change lanes more safely. Available Blind Spot Warning gives you a heads-up if it detects a vehicle in the blind spot area. And if you start to move over, available Intelligent Blind Spot Intervention can apply the brakes and help guide you back. Parking is easier than ever. The available Intelligent Around View Monitor uses four cameras to give you a virtual composite 360º bird’s-eye view of your vehicle, with split-screen close-ups of the front, rear, and curbside views. It also gives you an on-screen heads-up when it detects moving objects near your vehicle. We’re looking at you, shopping cart. Avoid an unplanned game of bumper cars. Intelligent Back-up Intervention can sense cars crossing behind you when you’re getting out of a spot and can engage the brakes to help avoid a collision. The available Mobile Entertainment System lets rear-seat passengers enjoy movies – or even play video games by plugging in a compatible game system – while those up front can enjoy listening to something of their own. Armada® also helps keep you on track and in the loop with available NissanConnect with Navigation and Services. Featured is a selection of available plans and services ranging from customizable alerts to calling for help if the system senses there’s been an accident. The standard USB input makes it easy to personalize your music. Listen to your hand-picked favorites, browse artists, select playlists, and more, all through the audio system. For concert-hall sound, the available Bose® premium audio system features 13 high-end speakers custom-tuned for the vehicle’s interior, including a subwoofer for intense lows. The Bluetooth® Hands-free Phone System activates via steering wheel-mounted controls, so you can keep up with connections no matter where the road takes you. Nissan’s Advanced Air Bag System has dual-stage driver and front passenger supplemental air bags with seat-belt and occupant-classification sensors. 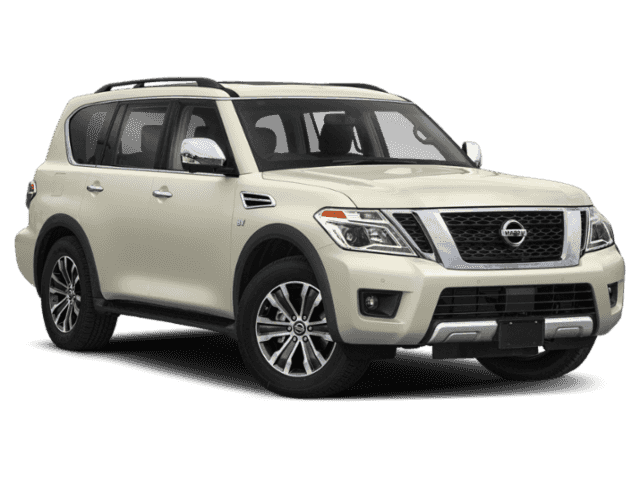 Armada also features front seat-mounted side-impact supplemental air bags, and roof-mounted curtain side-impact supplemental air bags with rollover sensor to help provide outboard occupant head protection for all three rows. Electronic Brake force Distribution (EBD) sends extra force to the rear brakes when you have additional weight in the vehicle. And when it detects hard braking and senses an emergency situation, Brake Assist (BA) helps you out by applying maximum braking force. When a collision is unavoidable, Nissan’s Zone Body construction absorbs crash energy to help protect the passenger compartment. 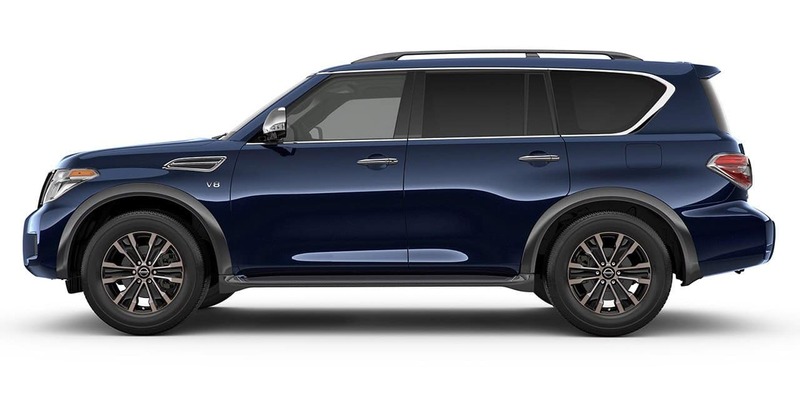 It includes front and rear crumple zones, energy-absorbing frame side members and crossmembers, and a reinforced body structure and bumper height. When tire pressure is low, Armada’s Tire Pressure Monitoring System (TPMS) illuminates an icon on your dash to let you know. Powerful and efficient, the 5.6-liter Direct Injection Gasoline V8 features dual overhead cams, 32 valves, and an innovative VVEL valve control that enhances throttle response as well as fuel economy. 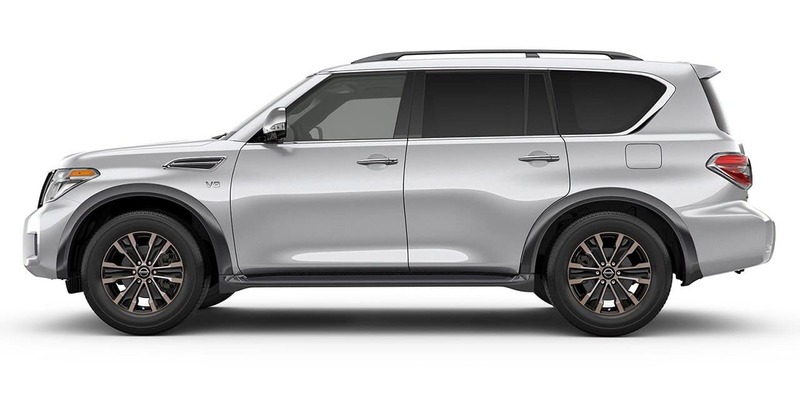 Plus, with best-in-class maximum horsepower (390 horsepower and 394 lb-ft of torque), Armada has an impressive 8,500-lb. maximum towing capacity. Intelligent 4×4 is so advanced, it responds instantly to changing road conditions and continuously adjusts the amount of power distributed to each axle to help maintain control. Keeping an eye on the situation as well as the bottom line, all-mode® automatically switches to 4WD to improve traction on lower-friction surfaces, and switches back to 2WD for optimal fuel economy when more traction is available. Price is Manufacturer’s Suggested Retail Price (MSRP). MSRP excludes tax, title, license, options and destination. Dealer sets actual price. 2018 EPA Fuel Economy Estimates 14 city / 19 highway for Armada® 4×2, and 13 city / 18 highway for Armada® 4×4. Actual mileage may vary with driving conditions – use for comparison only.